The Nikon D600 has two Secure Digital (SD) card slots. Supported media card types include SD, SDHC, SDXC. The D600 supports UHS-1 (also sometimes noted UHS-I). SD media cards are designated with a Class rating, higher class numbers support faster read and write speeds.. It is recommended to use a minimum of Class 6 for movie recording. Higher class cards, such as Class 10, allow faster writing for increased performance when shooting a burst of images. These cards can also be read faster when downloading images from the card. The following cards have been tested and approved work in the Nikon D600. Other cards may work, but have not been tested. To assure compatibility, choose one of the following cards. The Nikon D600 supports Eye-Fi Wiresless SD cards. 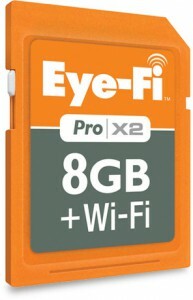 When a compatible Eye-Fi card has been inserted into a SD card slot, the information display will show an icon to display the status of the Eye-Fi. The upload option can be enabled by pressing the Menu button and selecting the Setup Menu. To assure maximum compatibility, make sure the Eye-Fi card firmware has been updated to the newest version. Today I was using a class 4 SD card. It was working really slow whenever I tried to view and image. Then for some reason all the images disappeared when I went back to view them again. I noticed after that each time I took images on that card it would disappear. Came home and tried recovery programs to see if I could get them back, because the card count was showing that each time I took an image the number would go down. The recovery program found the files but it was in Jpg format, when I was shooting in RAW all day. Any idea how this happened? Very useful and precise information. Thanks a lot.